The most famous battles of the first world war were fought on the fields of France and Belgium. The most memorable war paintings – John Singer Sargent’s gassed soldiers on the Arras-Doullens Road, Paul Nash’s evocation of Passchendaele – depict the same territory. A new exhibition, “War in the Sunshine”, concentrates on a lesser known campaign, in which the British joined forces with the Italians to repel the Austro-Hungarian army in northern Italy from 1917 to 1918. On show at the Estorick Collection, a jewel-box of a gallery in north London best known for its Italian Futurist works, it includes work by a trio of Britons: Sydney Carline, a painter, and Ernest Brooks and William Joseph Brunell, both photographers. The first world war coincided with one of the most exciting and turbulent periods in the history of art, when Cubists, Dadaists, Futurists and Expressionists battled it out to create new visions of the world. The artists commissioned by the British government to record the events of the war were often inspired by these movements to produce avant-garde paintings. Carline admired the Futurists and rejected the Victorian academic style. While studying at the Slade, he attended the first Post-Impressionist art exhibition in London in 1910. 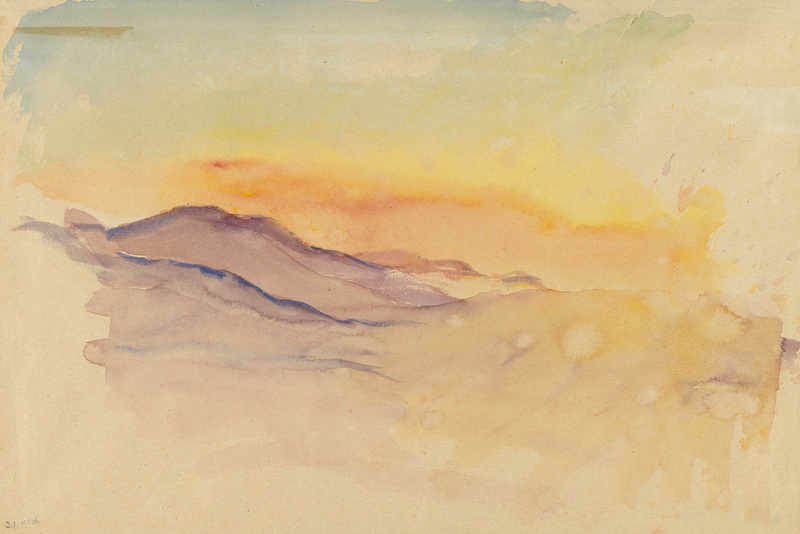 He volunteered for the air force in 1916, and was posted to Italy in early 1918; that summer he was accredited as an official war artist. In his paintings at the Estorick you can see the influence of Cézanne, Gauguin and the alpine landscapes of the Symbolists. The ministry of information was well aware of the power of images: it only allowed a few official photographers near the front – civilian photographers were banned. 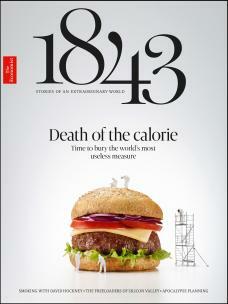 Work was carefully censored, first in Italy and then back in London. Images of corpses were forbidden. Brooks, who had been a successful royal photographer before being assigned to the Western Front in 1916, chafed at efforts to keep him away from what he called “the sharp end”. He and Brunell were tasked with producing patriotic reportage; their images were distributed to newspapers, press agencies and turned into postcards – the ministry even had its own shop, just off Piccadilly. 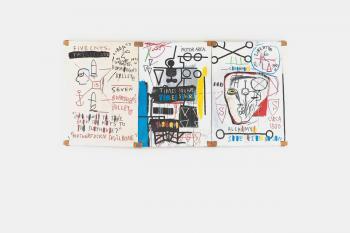 Their work shows life behind the lines: its misery, mundanity and occasional flashes of humour. This joyful sketch is imbued with Carline’s love of flying. The Sopwith Camel was a notoriously difficult, unstable plane, but Carline was a brave and skilful pilot who even experimented with sketching while airborne. He was an admirer of the Romantic poet and painter William Blake, but had also been exposed to the work of Wassily Kandinsky while studying art in Paris immediately before the war. Both are in evidence in the sketch’s luminous colour and loose, confident handling of paint. During the war, Carline took part in a dogfight over the River Piave in which he downed an enemy plane. It was an event that later haunted him. 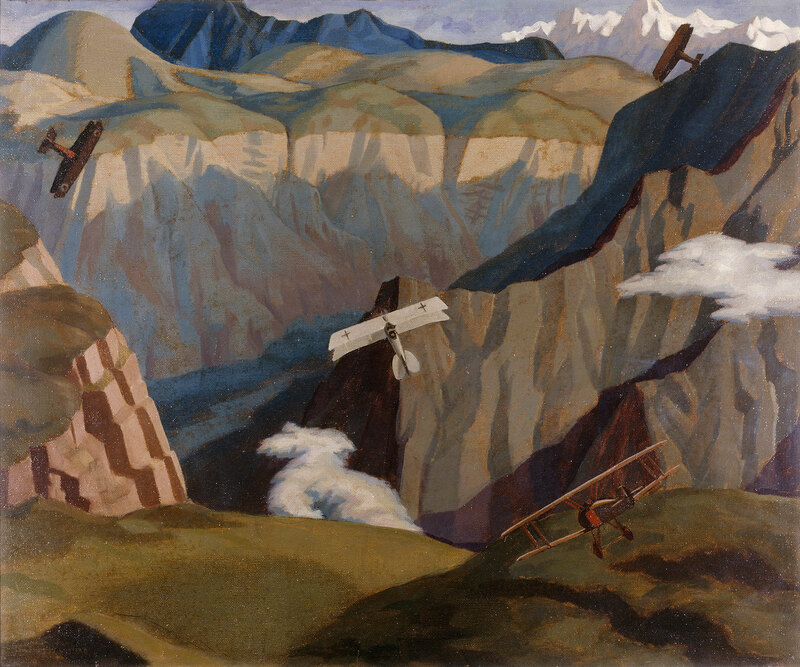 Here he draws on that experience to capture the moment an Austro-Hungarian reconnaissance aircraft is shot down by three circling Sopwith Camels, before plunging to its doom in the dramatic Brenta Valley. The stylised composition draws the eye to the pale, moth-like plane and the menacing darkness below. In 1919, it was shown at the Royal Academy, where he was hailed as an “intrepid birdman painter”. War photography was in its infancy and it was not until the Spanish civil war and the groundbreaking photographs of Robert Capa (who admired Brooks) that it would be considered an art form in its own right. 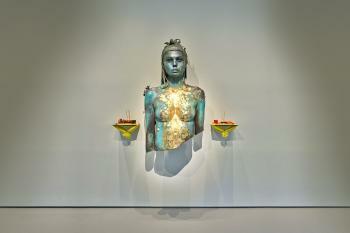 Brooks’s work gives an insight into life at the front. 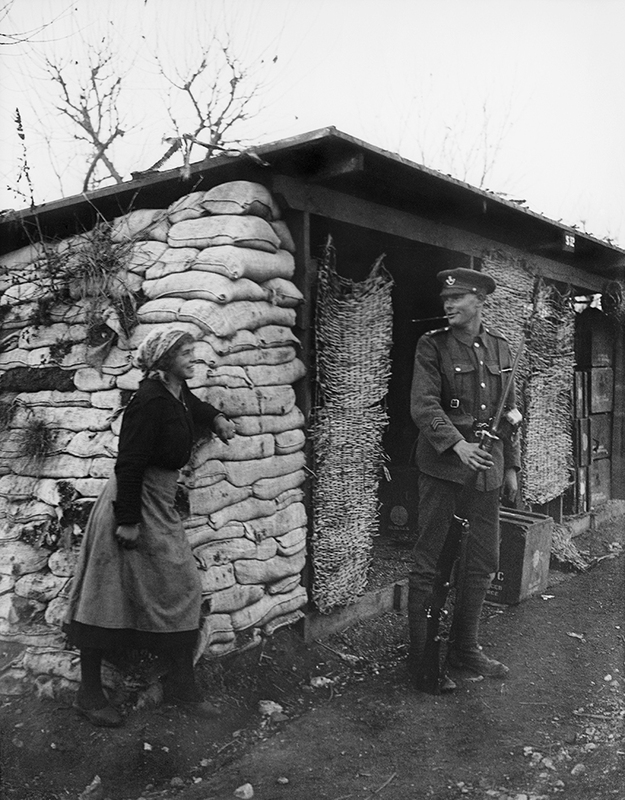 He was particularly sympathetic to the travails of the ordinary British soldier and, with his just-about-holdable camera, pioneered an informal style of photography. 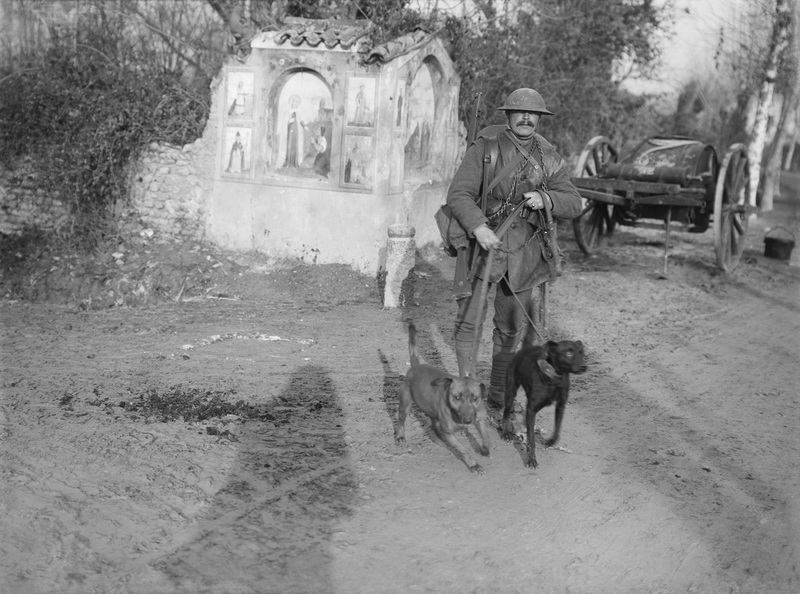 This image shows a British soldier with his messenger dogs, who would be sent between handlers along the lines – a canine pigeon post. Brooks’s shadow can be seen in the foreground, reaching towards a roadside shrine. While Brooks’s chief focus was the Tommy, Brunell – an altogether gentler character than Brooks – had a wider range of interests. He took sympathetic portraits of defeated Austro-Hungarian prisoners of war, of the many Italian women employed by the British army to unload supplies, and the daily interactions of both with British soldiers. 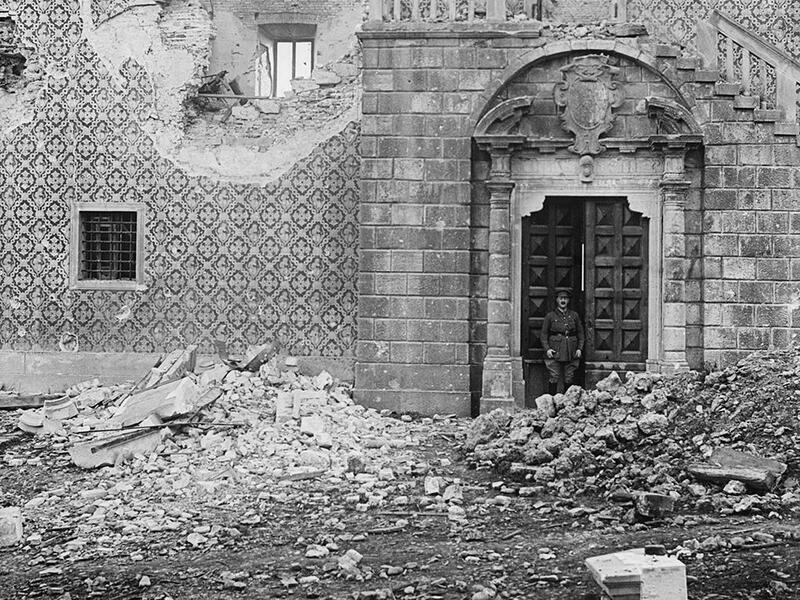 He also documented the destruction of many historic Italian buildings. 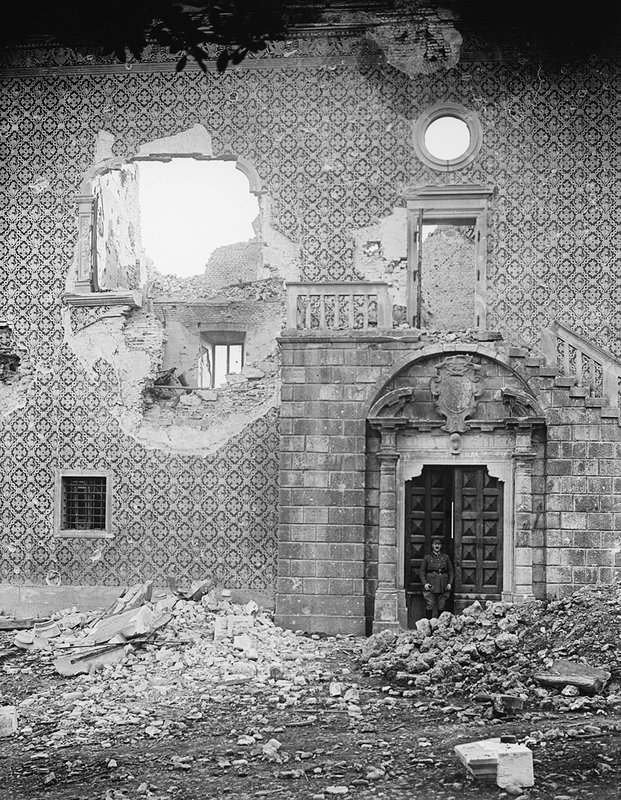 This beautifully composed picture shows the remains of a mosaic wall at a castle in Treviso which was used as an observation post by the Austro-Hungarians and largely destroyed in the Italian campaign. The figure in the doorway may be a British intelligence officer who sometimes accompanied Brunell: the ministry liked to keep an eye on its war artists. After the war, making a living from painting became difficult for what Paul Nash called “war artists without a war”. Fortunately, Carline had friends in high places, among them Roger Fry, a painter and art critic. He remained a fringe member of the Bloomsbury Group, and eventually got a job at the Ruskin School of Art in Oxford. 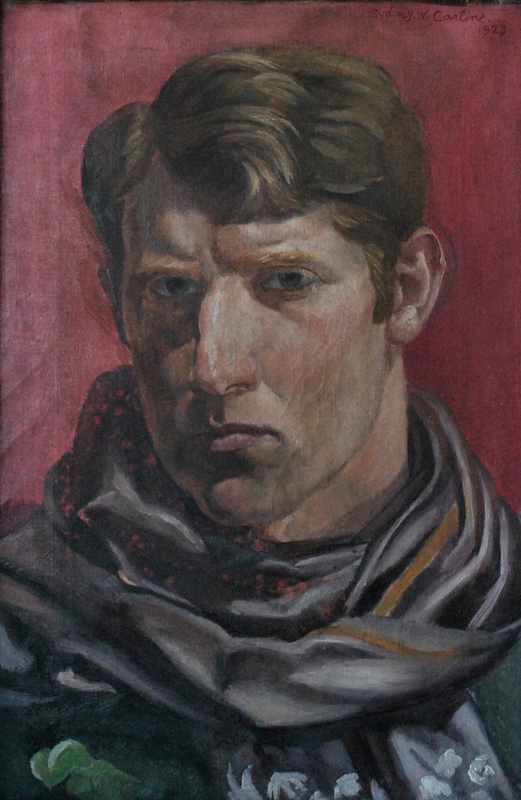 This self-portrait shows him as a brooding, fearsome presence, even though he was generally considered to be pleasant and self-deprecating. He died in 1929, aged only 40, after a bout of pneumonia, just weeks after the opening of his first solo exhibition in London.